The smell of gingerbread is in the air! Celebrate this holiday classic with one of our 30+ gingerbread crafts for kids. Whether you’re looking for edible crafts or ones made of clay, felt or other craft materials, we have you covered. There are crafts for kids of all ages and ability levels. Here are 10 of our favorite gingerbread crafts for kids. 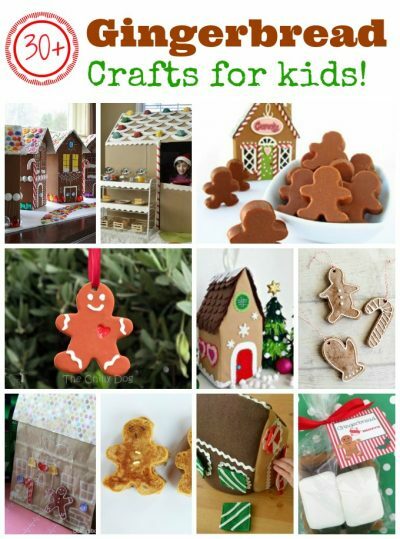 Be sure to check out all of our gingerbread kids’ crafts! 1. Felt Gingerbread House Tissue Box Cover – This beautiful gingerbread house is hiding a tissue box! This sewing project can be as simple or as complicated as you want to make it, and there is so much room for creativity. 2. Gingerbread Salt Dough Ornaments – Make durable salt dough ornaments that smell and look like gingerbread cookies. They look festive on the Christmas tree and make great gift toppers. 3. Cardboard Gingerbread House – Imagine how much fun kids will have with a life-sized gingerbread house! Make the base from cardboard boxes, add all sorts of colorful candy-inspired decorations, and watch the creative play begin. 4. Gingerbread S’mores – What do you get when you combine gingerbread cookies, milk chocolate and marshmallows? A delicious treat that you’ll be craving all year long! 5. Mock Gingerbread Ornaments – Use oven-bake clay to create beautiful gingerbread ornaments that last for years. These make wonderful gifts. 6. Gingerbread Truffles – These cute chocolate gingerbread truffles look and taste like gingerbread cookies. They’re a fun treat to make and give for the holidays. 7. Gingerbread House Christmas Village – Turn empty milk cartons into festive gingerbread houses that you can enjoy year after year. Add to the fun by creating more each year. 8. Gingerbread Pancakes -Change any pancake recipe into gingerbread pancakes with just three simple ingredients. Make the pancakes with a gingerbread cookie cutter and breakfast will really be something special. 9. Lunch Sack Gingerbread House -Make lunch a little more exciting by turning a plain lunch sack into a cute gingerbread house. These bags are also a fun and inexpensive way to wrap holiday gifts. 10. Felt Shapes Gingerbread House – Cover this cute felt gingerbread house with candy-inspired rectangles, scares, and circles to help young children learn shapes. What a fun project for winter! You can see all 30+ gingerbread crafts here.